Comfortable typing for your laptop, tablet or smartphone. 30% smaller than traditional clunky keyboards and as light as a billiard ball (6.7oz). Save more space on your desk or in your bag! Enjoy quick, quiet typing on this comfortable keyboard. Shortcut keys save you time launching tasks or controlling media. With replaceable AAA batteries and power-saving mode, this keyboard lasts for more than 3 months at a time. • After 30 minutes of inactivity the keyboard will automatically go into power savings mode. Simply press any key and wait 2-3 seconds to wake it up. • For Android 4.4 and 5.0.1 users: The Caps Lock indicator will NOT light, but will still function normally. • This keyboard is not compatible with Mac OS X El Capitan. Cross-Compatible: Works with iOS, Android, Mac and Windows, with shortcut keys for all four systems. Lightweight & Compact: 30% smaller than traditional clunky keyboards and as light as a billiard ball (6.7oz). Comfortable Keys: Type quietly and effortlessly on comfortable, low-profile keys. Low ­Power Consumption: Lasts over three months (based on two hours use per day) with power-saving mode and space for two AAA batteries (not included). 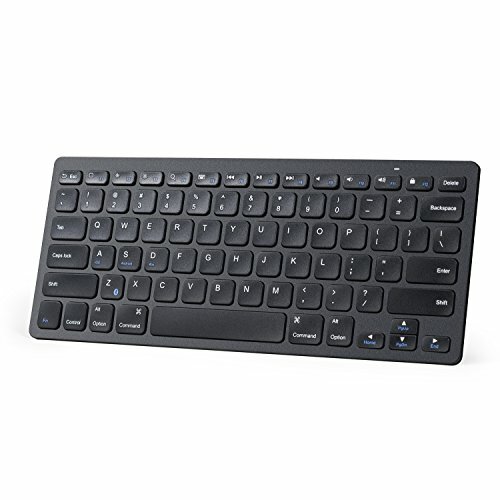 What You Get: Anker Bluetooth Ultra Slim Bluetooth Keyboard, welcome guide, our our worry-free 18-month warranty and friendly customer service.